Herbs play a significant role in the flavor structure of a given dish. The world, although geographically separated, are defined by the culinary flavors as determined by the indigenous herbs on top of the food available in the land. Modern technology has allowed plants to cross geographical borders and to be cultivated far from their places of origin but the different cultures have long been steeped in the herbs that they had from time immemorial. For example, garlic chives and garlic with fish sauce and vinegar says Philippines; the combination of mint and oregano with Feta say Greece; curry (a mixture of many herbs and spices) and coconut and some spicy peppers say Thailand; Wasabe on soy sauce and seaweed say Japan - just to name a few. That is reason that sometimes the addition of a specific herb to your dish at home brings back memories of a place that you once visited. However the reason I'm writing this article is to remind home gardeners that herbs should be part of every garden. Herb Garden.. Herbs are better when they are fresh when their aroma has not left them yet. That is why some grocery stores now carry live herbs that you can grow in your kitchen. But believe me, they don't do well in the kitchen unless you they get at least four hours of sun in there. The best solution to having a good and prolonged supply of herbs is to have an herb garden - even if it is done in a container. It does not have to be sophisticated; a good-sized container and some potting soil and some hours of direct sunlight. Choose Herbs That You Like. There is nothing more useless than planting herbs that you do not use. Well, I take that back because if you don't use them they will flower and attract bees - which is a good thing. But if you grow herbs for culinary purposes then you better plan on the ones you like on your food and actually use. Keep using them to encourage new growth. Clip off the flowers to keep them going for a while. And for annuals you might want to plant a second batch. Since most annual as well as perennial herds produce mostly in the warmer months, it is a good idea to preserve some of your harvest. The Internet provides a vast information on how to preserve the different herbs. As for my family, we like to make basil pesto in the summer - then freeze them. We seem to always have frozen pesto in the freezer ready for use in various dishes. This year, because we planted a lot of cilantro, we might have enough to make cilantro pesto. Near the Kitchen. There is a great benefit in growing herbs in places where they are visible from your kitchen. Sometimes we pull out the drawer in the fridge to check what herbs we have but won't it be nice to look out the window to see which herb you can use for your dish? When we can see them from the kitchen window we get reminded to harvest them and sometimes to water them - especially during the hot summer days. Every home should have a functional herb garden, I think. Rosa 'Eden': Beautiful romantic rose. 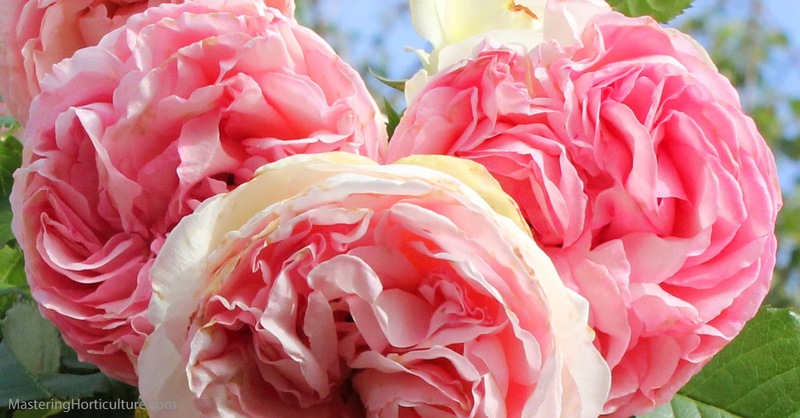 The glorious time for Eden rose has come to my garden once more. It is blooming! It is a beautiful romantic rose. However, the subtlety in its color and fragrance is offset by its exuberant growth habit and the extravagant inflorescence. The flowers are composed of thick piles of overlapping petals - making them so heavy that makes them always in a drooping position. 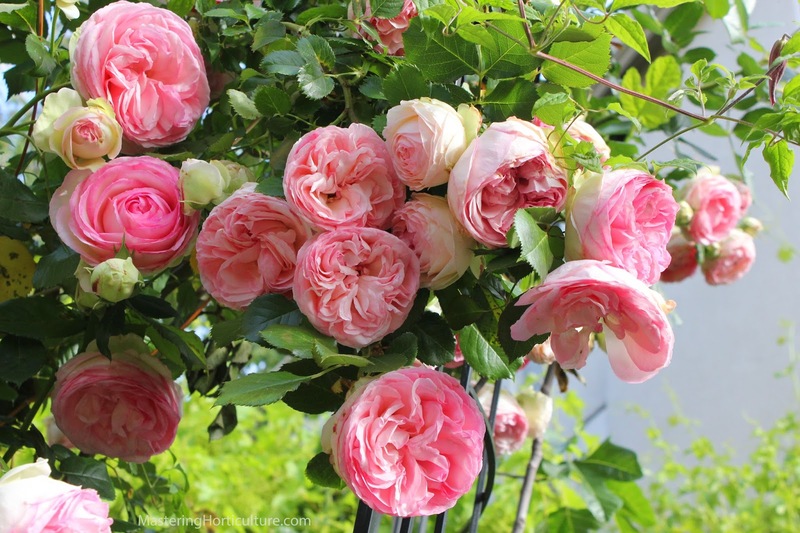 It is a good thing that this rose is a climbing type because it is better to appreciate the flowers from below. 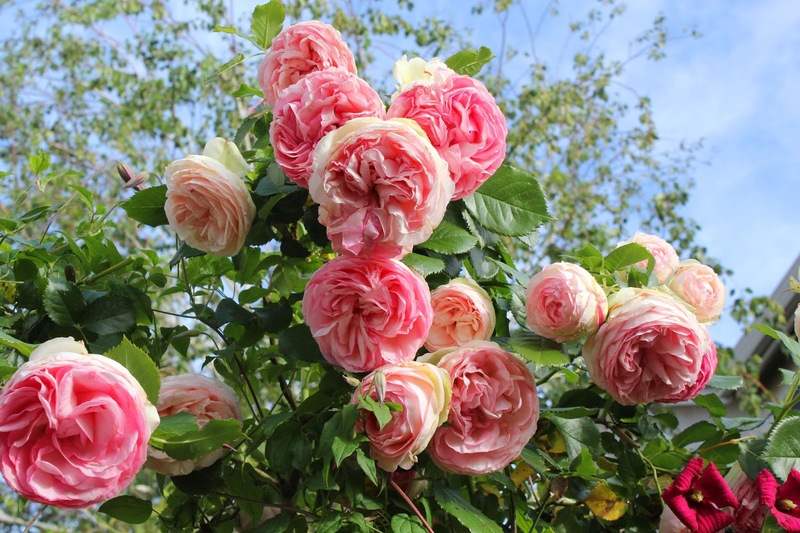 Rosa Eden: Exuberant growth habit and extravagant inflorescence. Owing to the season of abundant precipitation we had after a long drought, all my plants are generally performing good this year. However, good things seem to come with some challenges. In the case of this rose, I had to prop the canes temporarily to prevent them from breaking due to the heavy weight of the flowers. Clematis 'Niobi rambles on Eden rose. One of the things I have done in the past years is to plant clematis among my climbing roses. In the pictures, you can see Clematis 'Niobi' rambling among the roses. I found this to be good especially with roses that bloom heavily in the spring and sparingly afterwards and those that are prone to diseases that cause some defoliation. The clematis provides the necessary color and interest during the ugly period of the roses. Yes, I always say that roses are beautiful when they are not ugly. And I am always in the business of trying to mitigate this problem of ugliness on the plant that is supposed to be a bearer of the symbol of beauty.